William Sawyer hanged on this date in 1815* at London’s Newgate Gaol for a murder he committed while in Portugal. When this third wheel discovered their liaison,** Sawyer and Gaskett fell into that death-seeking tragic mooning that lovers do and after dinner one night in April they wandered off to the garden. Other guests soon heard three pistol shots crack the evening air. The reports proved to correlate with a dead Harriet, and a severely (but not mortally) wounded William. After he was cleaned up — and after he once more failed to kill himself by slashing his own throat — his friends solicited a forthright confession. Having laid violent hands upon myself, in consequence of the death of Harriet, I think it but justice to mankind and the world, being of sound mind, solemnly to attest that her death was occasioned by her having taken part of a phial of laudanum and my discharging a pistol at her head, provided for the occasion. I took the residue of the laudanum myself, and discharged two pistols at my head. They failing in their effect, I then retired to the house and endeavoured to put an end to my life, leaving myself the unfortunate object you now behold me. Besides doing the tragic lover thing, Sawyer was obviously intent on doing the officer-and-a-gentleman thing. His friends did very well believe the convenient-sounding version of events that he presented, such was his rectitude and lovesickness. But under any construction of motive and circumstance, this narrative of “discharging a pistol at her head” amounted to confession to a hanging crime and Sawyer was convicted with ease. Sympathetic to a fault, the Lord Chief Justice Ellenborough who personally tried the case reserved judgment as to the penalty pending a review by a panel of the king’s judges of several technical legal points. These were all defeated as entirely as was Sawyer’s wife’s attempt to see him in prison. Despite his avoiding such an awkward interview Sawyer went to the gallows “very dejected,” in the words of the Newgate Calendar. During the ceremony a profound silence prevailed throughout the populace. He died under evident symptoms of paroxysm, and a quantity of blood gushed from his mouth, from the cut in his throat. At nine o’clock the body was taken to Bartholomew’s Hospital in a cart, attended by the under-sheriff and officers. He was dressed in a suit of black, and [it] was not ironed. * The Newgate Calendar, whose command of detail is often unreliable, mistakenly gives May 22 as the execution date — a week later than the true event. ** Intent on layering on the melodrama, Sawyer’s story was that the friend had actually given the two lovebirds leave to go live together. Great! Except Gaskell was convinced the permission was insincere and that he meant on killing himself once they did so and “although she had promised not to live with me, she had not promised not to die with me.” Anything for love. 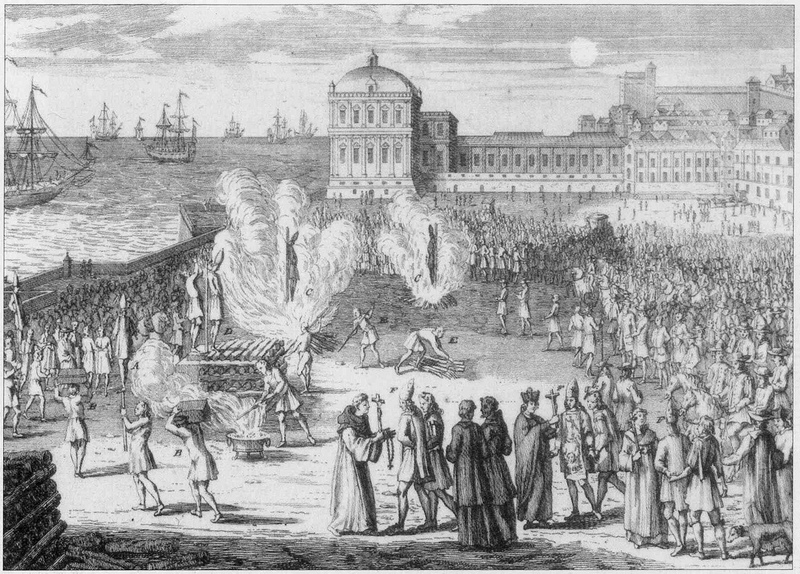 On this date in 1624, Coimbra University theologian Antonio Homem was burned at the stake in a Lisbon auto de fe. Homem came from a “neo-Christian” family, Jews who had been forced to convert to Christianity. Considering the compulsion, one could fairly question the piety of such “Christians”; in a great moment in damned-if-you-do, damned-if-you-don’t, the Spanish Inquisition fired up to probe the potential un-Christian activity of neo-Christians. Homem’s family’s response was to be more Catholic than the Pope and have Antonio trained for the clergy; he became canon of the Cathedral of Coimbra and a doctor at the University of Coimbra. Homem was in his fifties when it became known among his colleagues that he was of New Christian stock, and this circumstance soon attracted unwanted attention — and eventually, his denunciation for allegedly leading a secret Judaic cell. 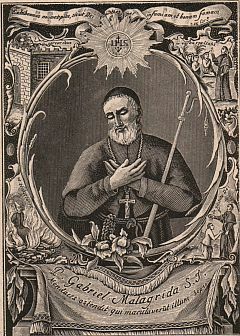 Homem, it is said, “often took the part of priest”; The Other Within: The Marranos, Split Identity and Emerging Modernity describes a Kippur ceremony from the Inquisition records. The inner life of the converso is a great riddle from our distance of time and context. It is immediately tempting to perceive religious martyrs here, people who were forced underground but still kept what they could of the faith of their fathers at risk of life and limb. Such a reading paradoxically allies us with their persecutors, for it is by the Inquisition’s hand that we have the evidence — and this is a source whose evidence we greet very skeptically when it, for instance, charges conversos with murdering Christian children. Inquisitors all around Europe were after all involved in these very years in scaring up secret witches’ covens to incinerate, and it was not unknown for the deadly judicial apparatus to be borrowed here and there from restraining the minions of Hell in order to service business opportunities, political aspirations, or private grudges of the personal or professional variety. Try asking a present-day academic how easy they’d sleep knowing their colleagues on the tenure committee also had a few buddies in the Holy Inquisition. 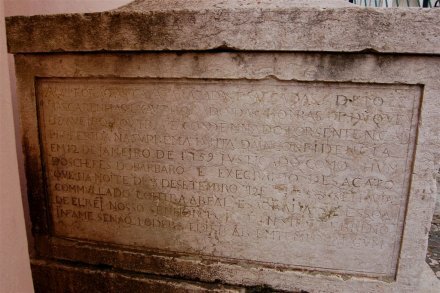 Homem was eventually among eight burned (Portuguese link) at an auto this date at the Ribeira de Lisboa, and his house was torn down to be replaced with a pillar inscribed “Praeceptor infelix”. Prior to their destruction they were favored with the preachings of Friar Antonio de Sousa who railed against the insidious Semitic threat to homeland security. Readers with Portuguese proficiency can find more on this case in this 1999 book exploring the Inquisition’s Coimbra archives, or in Antonio Homem e a inquisição. * For the setting of this post, the 1620s, Spain and Portugal are under the personal union of a common monarch, Philip IV. ** We’ve mentioned it before. † One of the great (and eventually fatal) inefficiencies of the auto-de-fe system was its tendency to leave its future exhibits to languish for years in prisons before the prescribed spectacle could be properly arranged. On this date in 1761,* the Jesuit Gabriel Malagrida became a late casualty of the Tavora Affair and the Lisbon earthquake when he was garroted for heresy. Malagrida (English Wikipedia entry | Portuguese) was a 72-year-old Italian with decades of missionary service to the Portuguese New World colonies under his belt. And this only exacerbated his principal sin of being a Jesuit — an order whose diminution was eagerly sought by the rising statesman of Enlightenment Portugal, the Marquis of Pombal. The shock of the 1755 Lisbon earthquake would deal Pombal the trump hand he needed to start reshaping both city and society to his liking. This published pamphlet merely echoed what many of the order were saying in the pulpits, and Pombal was not about to let the backwards, superstitious crowd** own the catastrophe. Malagrida was banished from Lisbon: and, when the Tavora family was implicated in an attempt to assassinate the Portuguese king, Malagrida, their confessor, found himself clapped in prison. Though the now-septuagenarian priest did not share the Tavoras’ grisly public butchery, he was left to molder. A couple years in a dungeon saw him go a bit strange, and supposedly he published treatises with such eccentric features as God’s personal instructions to Malagrida, and Malagrida’s fascination with St. Anne’s uterus. Catholic sources, which consider Malagrida a martyr, doubt that he ever published any such thing; if he did, it seems apparent that it was dementia rather than heresy that afflicted the old man. staged in a dramatic way, even to the point of Malagrida’s appearing on the scaffold in Jesuit habit, to impress upon the Portuguese and the world at large that an old order had come to an end and a new one was to be established … one might say that … symbolism at the cost of one human life was a relatively humane procedure in comparison with the symbolic elimination of whole classes of society in the twentieth century. Detail view (click for the full image) of Malagrida executed at a Lisbon auto de fe. CC image from Ricardo Mealha, original provenance unknown. 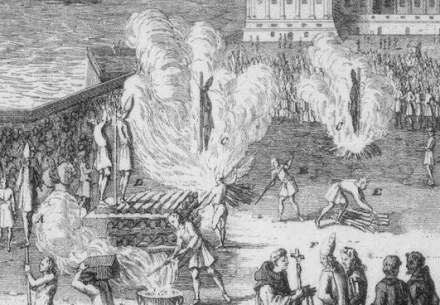 Pitying the superstitious Jesuit at the stake, Enlightenment secularist Voltaire inveighed against Enlightenment secularist Pombal for conducting the execution … just part of Voltaire’s queer ideas about not killing people over their religious beliefs. But Pombal’s expedient use of the Inquisition’s medieval machinery to make an example of Father Malagrida would not be the start of a pattern; the Pombaline reforms of the years to come brought the Inquisition sharply to heel, and it was Malagrida himself who was its last victim (pdf) in Portugal in its classical ecclesiastic form. 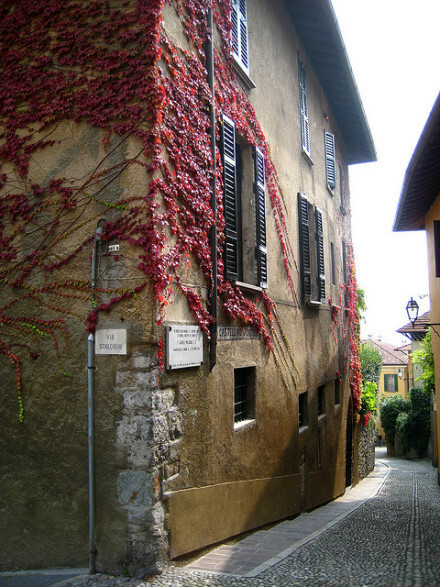 The house where Malagrida was born in Menaggio, Italy is marked with a plaque. Image (c) kallipyg and used with permission. * Some sources give September 20 as the date. ** The “God is pissed” hypothesis was posited against theories of earth’s vapors promulgated by the Pombal-sponsored scientist Ribeiro Sanches. † Anti-Jesuit sentiment was widely abroad in Europe at this time; increasingly resented as political manipulators, the Society would be suppressed by papal order in 1773, only to revive during the post-Napoleonic reaction. ‡ Malagrida was well-known to contemporaries in Europe, but that does not mean sympathy for him was universal. The British pol Lord Shelburne was satirized as “Malagrida” for his putative duplicity. 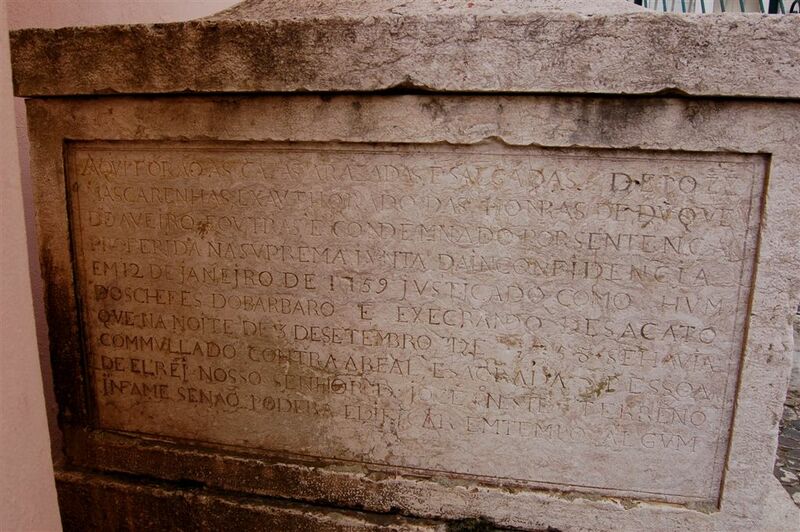 Two and a half centuries ago today, Portugal’s noble Tavora family was extirpated in Belem. [A] scaffold eighteen feet in height was erected in the market-place of Lisbon, during the night of the 13th, round which was drawn up a cordon of military. Precisely at 7 o’clock in the morning, the old Marchioness of Tavora, as the most guilty, was brought upon the scene, her hands bound, and a rope round her neck. She was placed on a chair, and her eyes being bound, the executioner struck her head off without the previous utterance by her of any complaint. After her came the twenty-one-year-old son, Joseph Maria de Tavora. They bound him on a cross raised aloft, broke his arms and legs with iron clubs, and then strangled him with a rope. The same fate befell [Tavora son-in-law] Jeronimo de Ataide, Count of Atouguia, the young Marquis Luiz Bernard de Tavora, colonel of cavalry, his servant Blasius Joseph Romeiro, Corporal Emanuel Alvarez Fereira, valet of the Duke of Aveira, and the body-page, John Michael. 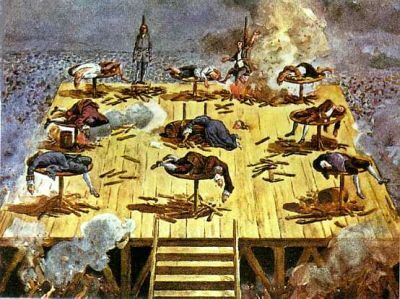 Their corpses were all flattened upon wheels, which were placed on poles, and this proceeding took up so much time that fully half an hour elapsed before another execution could be proceeded with. Other outstandingly gory images of this day’s business are here. After the page Miguel or Michael, the executioner took the old Francis d’Assis de Tavora, bound him on a St. Andrew’s cross, gave him three blows on the chest with an iron rod that resounded to a distance, shattered his arms and legs, and then gave him his coup de grace through the heart. The executioner’s men then, amidst wild shrieks, shattered the arms, legs, and thighs of the ninth victim, the old Duke of Aveiro, while still alive, then killed him by a blow on the chest, and threw him into the blazing fire. Finally, the tenth delinquent, the valet Anton Alvarez Fereira, brother of the above-mentioned Emanuel, was conducted before the corpses of the nine who had been previously executed, each one being shown to him; he was then bound to a stake, round which was placed a heap of wood, and this being set fire to, was raked together until he was completely consumed* … When the execution was over, the scaffold, together with all the dead bodies, was set on fire and burnt to ashes, which were thrown into the Tagus. [T]he palaces of the high nobility who had been executed were pulled to pieces and levelled to the ground, and salt strewed on the places where they had stood, as a sign that they should never be built up again. This stone marker was placed on the site of the razed palace of Jose Mascarenhas, the Duke of Aveiro. “On this infamous land,” it announces, “nothing may be built for all time.” Copyrighted image courtesy of Ludgero Paninho. Seems someone got the idea that the Tavoras tried to kill (and more problematically, failed to kill) Portuguese king Joseph I. 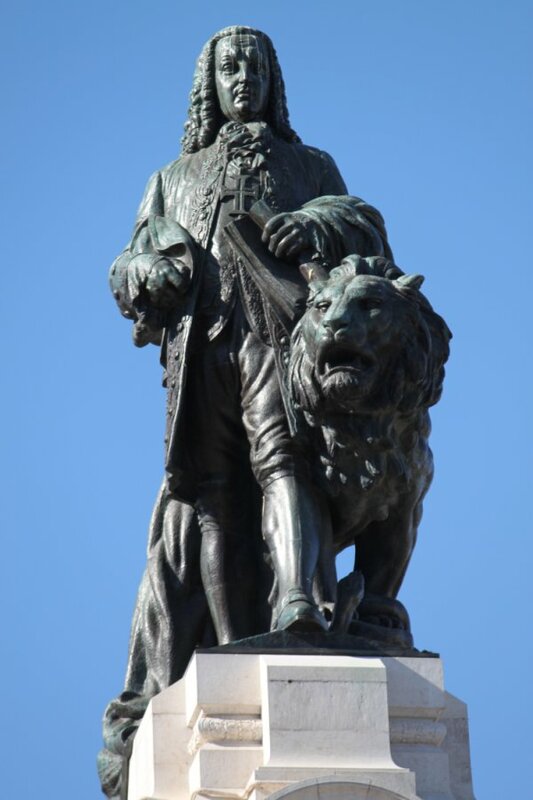 Whatever the facts of the matter, obscure behind a quarter-millennium, its attribution to the Tavoras and the spectacular revenge thereupon visited was effected by the king’s competent and ruthless minister, Sebastião José de Carvalho e Melo, the future Marquis de Pombal. 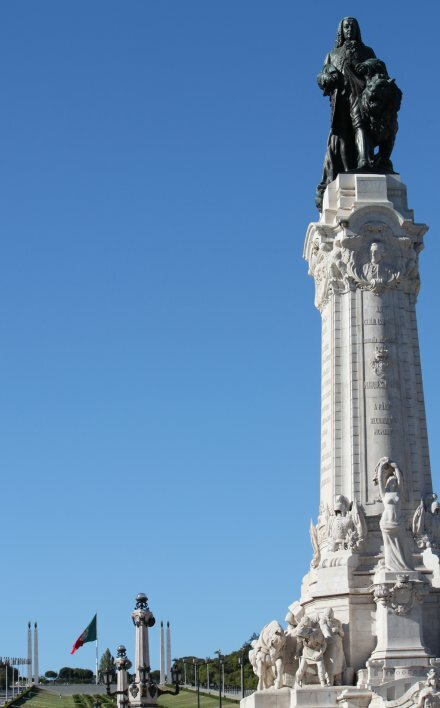 A monumental plinth surmounted by Pombal dominates the present-day Lisbon plaza named for him. 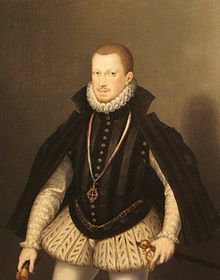 His able handling of the recent Lisbon earthquake had cemented his position as the throne’s right-hand man in a trend of centralizing absolutism not much appreciated by the old aristocracy (nor by the hidebound clerical orders, which explains why the aforesaid gory account of the execution ground comes from a German anti-Jesuit polemic). And he would not miss the opportunity an attack on the king’s person gave him to sweep away his opponents. The peers of the realm were summoned to witness their fellow blue-bloods so nauseatingly dispatched, and the Jesuits — “reported to have inflamed the Tavora family to their [the Jesuits’] desired pitch … in revenge for what had justly been done to them in South America”** — were forthwith suppressed. Melo/Pombal exercised the power of the state for the rest of Joseph’s life, but the king’s daughter and successor Maria I dismissed him — though she did not take punitive action against Pombal for his persecutions, as his enemies demanded. * Also doomed to burning alive was one Joseph Policarpo, who was able to escape the mass arrest a few weeks before and fled the kingdom. He was executed by effigy. ** This comment is from the letters of Christopher Hervey, an Englishman abroad in Portugal at the time of the execution whose 100+ pages’ worth of correspondence include live-at-the-scene reporting and English translations of the public pronouncements against the supposed culprits. As to the South American roots of Pombal’s conflict with the Jesuits, the order had resisted Pombal’s early schemes to reorganize and rationalize Portugal’s New World holdings in order to make the country a more competitive colonial power. Jesuit resistance to giving up the order’s control of education, and its humanitarian efforts to protect Indians, had been seen as contributing to an Indian rebellion that broke out in Jesuit-controlled territory — even to the point that Jesuits themselves were suspected of arming Indians in an effort to carve out church-controlled states. 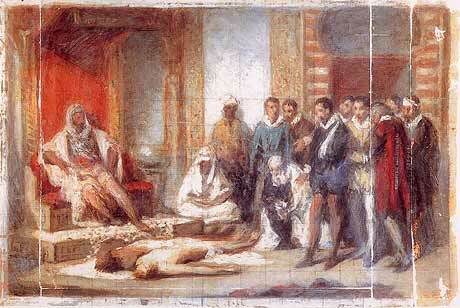 Hervey’s version has the Jesuits behind the plot in order to eliminate Pombal’s threat to their power. Others share this opinion … and Pombal, obviously, was keen to have his rivals inculpated for lese majeste in the public mind.